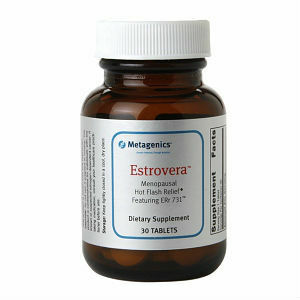 Estrovera, features ERr 731, which provides relief from menopausal symptoms almost as well as low-dose hormone therapy. It has been scientifically validated and proven to be more effective compared to other phytohormone supplements. Estrovera has been clinically proven to reduce hot flashes, night sweats, mood swings, sleep disturbances, anxiety, irritability and vaginal dryness. It also keeps the urinary tract healthy and relieves muscle and joint pain. Research shows that Estrovera can cause up to 83% reduction in menopausal symptoms. Rhapontic Rhubarb root extract (Rheum rhaponticum): Significantly reduces the occurrences of hot flashes. Other ingredients: Microcrystalline cellulose, stearic acid (vegetable), croscarmellose sodium, silica, and enteric coating (cellulose acetate phthalate, glycerol triacetate, ammonium hydroxide, hypromellose, maltodextrin, and polyethylene glycol). Ideal daily dosage is one tablet with food and water at the same time of the day. May worsen pre-existing digestive problems like diarrhea and stomach pain. A 30-day supply of Estrovera costs $34.95, while a 90-day supply costs $94.95. Compared to the price of common menopause supplements, this is on the higher side. This supplement comes with an 18-month money-back guarantee. If you are unsatisfied for some reason, the website provides you easy access to a return form, which you can fill and send along with the supplement. Is Estrovera By Metagenics Worth It? This is one of the rare supplements that have been found to be effective in clinical research. Multiple scientific papers and articles have been published about the effectiveness of this product in controlling symptoms of menopause. Jackie Horowitz	reviewed Estrovera	on November 1st	 and gave it a rating of 3.5.